Real estate company acquires community land in Kilifi for investment – Kenyatta University TV (KUTV). All Rights Reserved. A real estate company from Nairobi has acquired 3,200 acres of virgin community land at Magarini Sub county Kilifi County for sale to potential investors wishing to invest in crop production. Shamba Land agencies limited has since subdivided the land into pieces ranging from one to over 50 acres to sell at clients at only Sh. 50,000 per acre in the project dubbed Malindi green phase 2. Currently the first phase of the land subdivided into 450 acres is sold out and the Shambaland agencies authorities are opening up roads to ease access to their clients who mostly hail from upcountry. On Monday 86 clients from Nairobi who had brought land visited the site to see their land for the first time so as to know their property. The land is at Kapangani area located 65 kilometers from Malindi town and not very far from the One million acre Galana Kulalu food security project and the ongoing Sabaki, Majengo, Marafa Baricho new tarmac road being constructed by the national government. It has ‘undiscovered’ fertile soil that is ideal for agricultural production of pineapples Maize and cashew nuts. The area has a history of high poverty levels with sot locals depending on charcoal burning for survival. 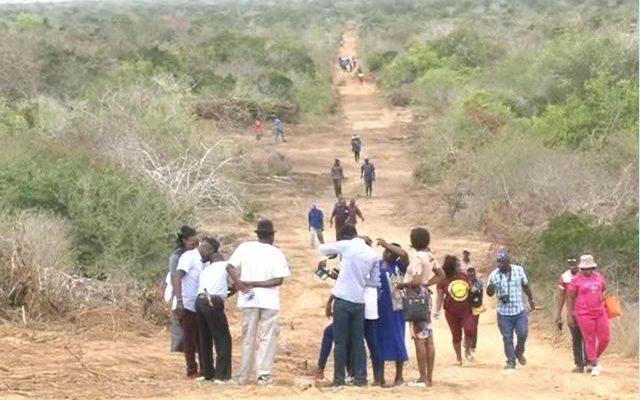 Journalists accompanied the investors who arrived by bus from Nairobi to the site in an open day and found roads being opened up for the first time in the remote area which has never been cultivated or occupied. Clients were told to only spend money for clearance or even burn the land and then plant pineapples and wait for one year to begin cultivating commercial products. Paul Mwangi the Chief executive officer for Shambaland properties said currently demand was high in the Malindi green phase two. He said Shambaland agencies have already earmarked 200 acres to begin pineapple farming as part of their economic generating activity for clients to see the potential in the area. Addressing the clients and locals at the site he said they also intend to build a school and create job opportunities for the locals. As a company he said they were upgrading 17 kilometer road from Sosoni area to the site so as to ease access for the new land owners. ‘”The soil is fertile and suitable for pineapple farming, one can invest 7000 pineapple plants and after one year sell the fruits to get a profit between Sh. 700,000 to sh. 1 million,’’ he said. Locals present thanked Shambaland agencies for coming up with the idea of buying and selling land to bring in investors to develop the land. Badiva Guyo a local said they are optimistic to see development in form of roads, electricity and water and even transport system. ‘We are happy to receive these guests from Nairobi in our area we are sure there will be development,’’ he said in an interview. Marafa Ward MCA Renson Kambi said the investors asked for land to buy from the community and are now subdividing it to clients who will come to invest in the area. He said the agricultural projects which will be initiated will help boost the economy and improve the livelihoods of the locals since the multimillion Pineapple project by Delmonte Company has taken years to kick off. ‘The project will create job opportunities, schools will be built, roads are already being upgraded,’’ he said.